Plant cell cultures may consist of dedifferentiated cells as well as of cells showing embryogenic potential. They can be used for very different purposes in research and biotechnology as well as for plant propagation. For such cell cultures, cryopreservation is the only means for long-term preservation. Most of the different cryopreservation approaches, which are generally used for plant tissues, have also been applied to plant cell cultures; they include slow freezing, vitrification, and encapsulation/dehydration approaches. The controlled-rate slow freezing approach which is described here, however, remains to be the gold standard for cell cultures. 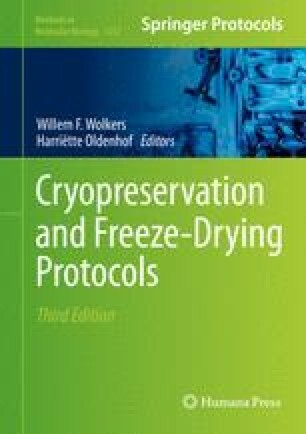 In this chapter, a standard cryopreservation procedure is presented for plant cell cultures.